Total calories (approx): 690 (how calories are calculated)  Note this is a ‘large’ portion. The chips or fries are also oven baked, not deep fried. 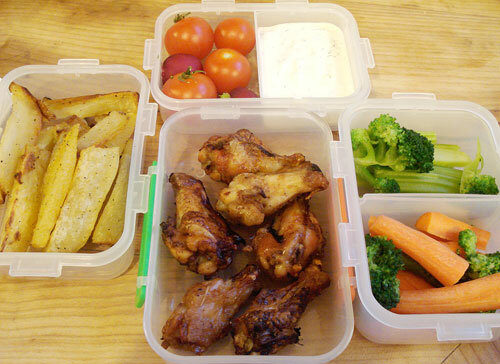 It looks like a lot of food, simply because it’s divided up into 4 Lock & Lock-type containers (the chicken one is a similar container - I ran out of Lock & Locks). It’s carried to work in a stack, held together in a plastic bag (nothing too girly) and dumped in a backpack. The chicken wings are actually leftovers from the night before; I just heated them up briefly in the morning and cooled them down again (this is for safety’s sake). The sweet potato chips were parboiled, then baked in a toaster oven for 10 minutes, but you could make them the night before too. The sauce is mixed together in minutes, and the vegetables can be cut up and stored in ziplock bags. 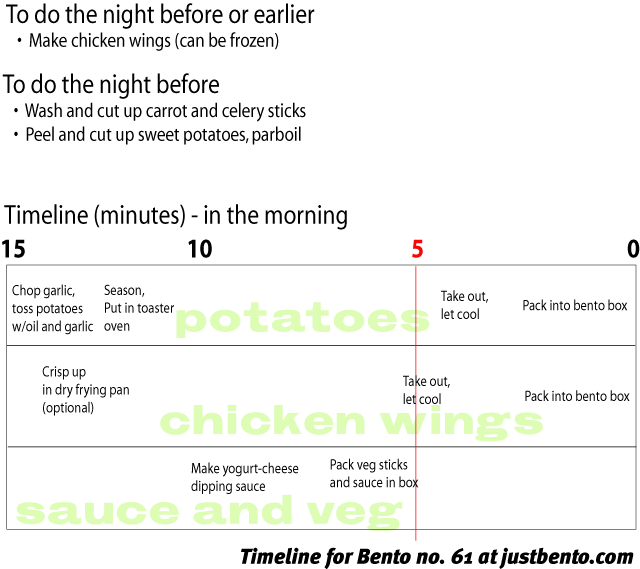 To make this a lower-calorie bento, just reduce the chicken wings to 4 (-130 calories), reduce the sauce to half (-70 calories), or both. Here are the very simple recipes for the chicken, potatoes and yogurt-cheese dip. I’ve presented them all together since they belong together, though of course you could use them individually. Cut the wings apart by the joints. Save the tips for soup stock. Sprinkle with salt and pepper, and leave for a few minutes on paper towels. Pat dry. (This makes the skins bake up a bit crispier). Put the wing parts in a plastic bag. Add the Tabasco and Worcestershire, and shake around well. Put in one layer on a baking sheet. Bake for 15 minutes, turn and bake for another 10 minutes. This keeps in the refrigerator for a 2-3 days, or you can freeze it and defrost it in the microwave or overnight in the refrigerator. Heat through briefly in a toaster oven or in a dry non-stick frying pan to revive some of its crispiness. Per serving; double, triple etc. for more. Peel and cut up the sweet potato. Put in a pan with cold water to cover, and bring up to a boil. Boil for about 5 minutes, until the slices are cooked but still firm. Drain well. You can do this part in advance. Line a toaster oven tray with aluminum foil. This is a replacement for the rich blue cheese dressing that is normally used for buffalo chicken wings. Mix it all together. It keeps for a couple of days in the refrigerator. The return of the timeline! Note that the yogurt sauce could be made the night before too, but it does develop a stronger cheesy flavor as time passes. Click on the timeline image for a bigger view.